Builing links to your websites is an integral part of the SEO process. It takes time and it takes research. You can waste a lot of time and money from errors in link building judgement. There are a lot of short cuts out there, but are they really worth it? One mistake a lot of beginning link builders make is not checking for the "nofollow" tag. A "nofollow" tag tells search engines not to follow the link. If you have a link on a reputable website that uses the "nofollow" attribute, then you won't receive the linking power credit you were shooting for. So whether you are posting a blog comment or a regular link, double check if the page is using the "nofollow" attribute. Another common link building mistake new link builders make is relying on link exchange services for building links to their site. Some of them are actually scams. I always like to check out how they do on their own link building. You can usually separate the scams from the legit companies by the quantity and quality of the sites linking to back to them. A third common link building mistake is buying a good bad link with irrelevant anchor text. Relevancy is an important factor in Google's search algorithm. Having the wrong anchor text for your website could result in a high bounce rate for lack of relevancy, especially if a visitor is expecting one thing based on your anchor text and gets something else instead. Not cool. These are the three common link building mistakes you can avoid when building links to your website in an effort to improve relevancy in search engines. Focus on building links using relevant anchor text from relevant sites that do not use the "nofollow" attribute. Niki Payne is a Social SEO Specialist for Extima Web with experience writing for newspapers, magazines and the Web. Learn more about Extima by visiting www.extima.com. It is informative post. These are the three common link building mistakes you can avoid so. I always like to check out how they do on their own link building. 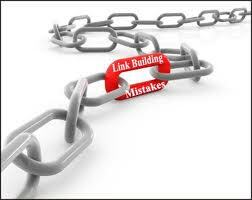 These information are informative to avoid mistakes of link building. These are very effective for link building tactics.